Our advanced handling package is fully adjustable to give you the capability of tuning the suspension to meet your ever changing needs. This is the ultimate setup for a street driven car that allows to you to soften the car’s ride for highway driving and trips yet still be able to stiffen the suspension for autocrossing and road racing. The struts are responsible for everything from cornering and body roll to steering response and overall ride quality. We offer the Tokico line of struts because of their superior workmanship, reliability, and affordable prices. These units are fully adjustable from “softer than a Touring model” to “stiffer than an R model”. Lowering the car with properly designed springs can dramatically improve the handling. 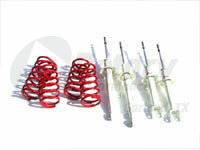 The spring kit we offer have been designed for the street and are completely compatible with stock struts. They are of a street-race design which both lowers the car and increases the spring rate noticeably. 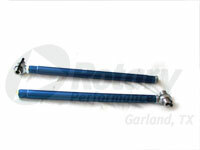 Trailing arms are a common suspension upgrade on your FD. The factory lower arms come from Mazda with a flexible rubber front bushing. Bushing flex adds an element of unpredictability and is definitely not desirable. The RP trailing arms cure this problem. The front bushing is completely eliminated with ultra strong Chromoly heim joints. In addition, these arms are designed to allow more clearance to the tire and wheel. These arms are all-new aircraft quality aluminum and look fantastic. Of note, these are the exact same arms that we use on our drag car. Sold in pairs ready to bolt right in. Tired of constantly replacing your toe-link outer bushings?These links are for you. 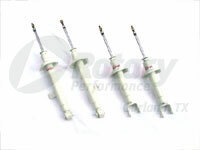 The factory rear toe-links are known for their outer bushings wearing out frequently. The result is clunking noises and a loose handling feel in the back of the car. Our RP toe-links cure these issues. Crafted from aircraft aluminum, these links are an exact replacement for the factory units and are fully adjustable. 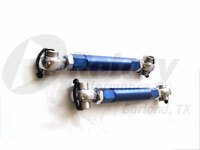 Both ends have ultra strong Chromoly heim joints about double the size of the Mazda OE units. Of note, Mazda uses a loose, flexible inner joint and ours do not. Solid, larger, and better looking. What are you waiting for? Sold in pairs and ready to go. Having a hard time getting your FD to launch hard? We all know that Mazda designed one of the finest suspensions ever put on four wheels. Unfortunately, several parts are a bit soft for good, predictable competition use. 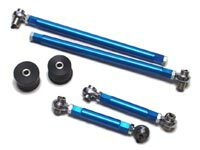 This package includes the latest version of our famous trailing arms, RP Rear Toe Link Set and solid differential mounts. The combination of these parts make a massive improvement in reducing wheel hop and making the car more consistent. Excellent upgrade for drag racing, autocross, or road racing. Sold together as a package for extra value. Tokico Illumina Struts have been our struts of choice for many years. After testing nearly every brand of strut available for the RX-7, we’ve found them to be the best for street and track use. Made by Tokico, who is the OEM supplier for Mazda and the majority of all Japanese auto and rebound simultaneously to 5 different settings so you can easily customize your RX-7’s ride quality to your own tastes. We have evaluated other manufacturers and they do not compensate for wear, offer adjustment for rebound only, or just insanely expensive. Performance and value, that’s what you’ll get with the Tokicos. Utilizing the best in technology from Tokico and Tein, we’ve packaged a tuned kit that’s designed for street and competition use. This kit includes the Tein spring set paired with tuned Tokico Illumina struts for a complete package which focuses on performance while remaining adjustable. This allows you to perform competitively on the track yet still drive the car to and from work. Find a good curvy road on the way home? Simply adjust the struts and have some fun! Also note that this tuned package will save you money compared to buying the components separately. Note: Springs are bronze in color, not red. Tein springs have been designed primarily for street use. They drop the Front approximately .85" and approximately .75" in the rear. The spring rate is also slightly higher than stock for a much more stable and predictable feel in the corners. 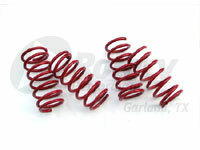 The advantage of these springs is that they improve the handling characteristics of the car without giving a harsh ride. © 2015 RX7.COM All Rights Reserved. Please direct comments or concerns here.